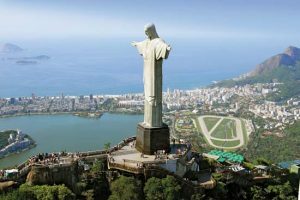 The statue of Christ the Redeemer in Rio de Janeiro was recently voted to be one of the modern Seven Wonder of the World, alongside the much older Colosseum in Rome and the Great Wall of China. It’s no wonder, when you consider that the colossal statue of Jesus Christ is the fifth largest statue of Jesus in the world. It is situated at the summit of Mount Corcovado in Rio de Janeiro, itself 2,319 feet high. The statue is 98 feet tall. It’s horizontally outstretched arms span 92 feet. It weighs over 1,400 tons, The statue is made of reinforced concrete clad in a mosaic of thousands of triangular soapstone tiles, and sits on a square stone pedestal base about 26 feet high. Funds to build the statue were originally raised privately, principally by members of the Catholic Church following WWI and the separation of Church and State. It was not built as a Catholic idol, but rather a reminder to the citizens of Rio de Janeiro that she should not abandon Christianity. Jesus’ outstretched arms signify peace and acceptance to all who dwell in or visit the city. The overall statue was designed by Heitor de Silva Costa. Paul Landowski is credited for the design of the head and hands. Landowski commissioned fellow Parisian sculptor, Gheorgehe Leonida, to sculpt the hands and face. 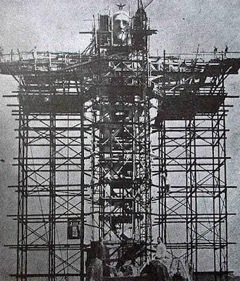 Construction of the statue started in 1922 and took nine years to complete. It was dedicated on October 12, 1931. The inner framework is made of concrete, and outer layers are composed of mosaic tiles. All the construction materials and the workers were transported to the top of the mountain by a cog-wheel train. They had to prepare the cement on site with water from a fountain that was 984 feet away from the scaffolding. Workers who made the mosaic tiles frequently wrote on the back, meaning Christ the Redeemer is littered with hidden messages…most likely prayers. The stones used came from Sweden. A chapel inside the pedestal can hold over 150 people. The statue is visible from anywhere in Rio de Janeiro due to its commanding height. Construction costs at the time were equivalent to $3,300,000 in 2015 dollars. Wouldn’t it be a grand vacation to visit Rio and view this awesome landmark? Interesting article. I saw a lot of this statue when the Olympics were shown. It is magnificent. I love the idea of the messsages on the tiles. 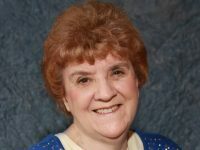 I like to write about unusual places and things, as well as promote my cozy mystery novels. Hope you will check out some of my other posts on unusual places and things. thanks for visiting.